Leopold (Bibi) Wenger on left, his home-town best friend Gilbert Geisendorfer on right, taking in the sun on the Köslin campus. Letter of May 6-May 18, 1939: I will now answer your questions: My birth certificate is in the middle drawer of my desk, in the back. You have hopefully by now received the disclaimer and sent it back. I was not asked any questions at the exam in Potsdam; it was like regular school and whoever participated regularly was rewarded. The emphasis was on swimming, diving, platform diving, broad jump, 100m sprint, 3km walk, shot put, gymnastics, horse jumping and floor exercises. I was totally numb afterward, and whoever could not handle it was dismissed. For other assignments, I had to write a letter to my English friend re. Bohemia and Moravia; for math and physics we had to calculate the speed of flight and fall and also describe the car and diesel engine. Plus a written test in Latin, [and] a dictation in English. I was asked to list some Austrian poets in German. I said Rosegger, Klöpfer, Springenschmied, Itzinger - the educator didn't know them; whereupon I was like, what? You don't know these men of whom some were in possession of the German literature prize? After that, I finished my exams. I sincerely congratulate Dad on his promotion to foreman. If Dad doesn't want to wear all his badges of rank at the same time, I suggest he take them all off and put on a platelet with SK on it (Siehe Katalog – See Catalog). Hermann 'the Iron' should do it like this! Well, my sore throat always heals fast. If it hurts in the evening, I wrap a wet towel around my neck and the next morning, I am fine again. In the evening we will be sent back to the Gollenwald (Gollen forest), which is only 20 meters away from our barrack. We are supposed to relax there. I am going to wait with my teeth because I am not in the mood nor do I have the time to do it right now. There's no censorship of letters. We can write whatever we like, and to wherever we like (also abroad). I'll send my report home again; too bad a C in History and Math! Thank you for the tissues, sewing kit and laundry tags. I have to sew white textile strips onto every laundry item, and write on it the full name in marking-ink. The package was on the way from May 5th to the 11th. Horseback riding is only for those who enjoy it and have the time. We, the 3rd group of a Hundred, are busy with other things. Fencing, shooting, swimming, topography, the study of engines, exercises at the wind tunnel, seminars about this and that, so that we are happy if we are just able to observe. Here we see the little cubs (Pimpfe-boys within the Hitler-Jugend) falling off the horses and jumping over the hurdles, which is a great joy. Today, some young men participate in the great riding and driving show of the Gau Pomerania for Köslin. Yesterday, we got a big Junkers engine in our workshop (the former gym hall); it is a visual model that is split in half so every process can be precisely viewed inside the cylinders, the carburetor, etc. Also a big car winch-tow and a number of airplanes arrived. A bigger hall has to be built yet. All of us are very excited about our practical lessons. We have digested enough theories already. Now I believe I have answered Willy's question thereby, as well. Who beat Willy? He beat straight back, I hope. He ought to watch his eyes. After all, eyesight is the most important thing. Something I forgot - I spent half an hour alone with the eye doctor, during the aviation exam, at which he, after a sequence of experiments, finally diagnosed that my pupils close too slowly after bright glare. I could see fabulously without glasses though, and nothing with glasses on. The entire examination in Berlin took from 7am to 5pm. And after that, I had to lead a group of 15 young men from one doctor to the next (Schlachtensee, Potsdam, Berlin); although I wasn't at home in the subject either. Let's go back. All young men who wish to become airmen at sea must learn how to sail now. Two in my barrack room do this. They sailed in very strong winds and great cold in the Jamundersee a week ago. Two boats (a cutter and a faltboat) keeled over and the young men and educators had to swim in the ice-cold water. There is a sea-airport nearby, so the boats, including the occupants, could be towed to land within two hours by aviation control boats. It must have been a keen picture to see an educator in his uniform jacket, shirt and dagger, standing by the mast because he was covered in water up to his belly. Now, I want to tell you a bit about the institution and my teachers. Our educators (housemasters) are also our teachers and between 22 and 35 years old. None is older. The head of the institution is 33. Most of them look older, though. All of them live together with their platoons and groups of hundreds in the same house. One platoon always consists of 30 young men. 12th Platoon = Class F 8b. 11th Platoon = Class F 7b, 9th Platoon = F 8a; (8th Platoon = Class 8, those are the old Napolans, all others are aviation platoons). Those five platoons are put together in the 3rd group of Hundreds. The uniforms of the young men and educators are different. (You can see them in the bundled booklet “Four Years Greater Germany" as well, in the right writing-desk drawer.) This uniform may only be worn within the institution while on duty, otherwise only HJ-uniform. The educators wear caps like the political leaders (black plate, dark-brown stripes), brown uniform jacket (like HJK-leader) with silver shoulder board, SA-armband, black breeches and boots and SA-dagger on a chain pendant. Now you can imagine them somewhat. All young men fit for military (older than 15 years old) wear bayonets, which are handed over to them ritually on November 9th, each time in relation with a plight. On our uniforms, we wear black shoulder boards with white fringes and white font (NPEA). You will gape at how much time I have to draw all this thoroughly, but today I am off for the entire afternoon. Well, now I am at my wits' end. But I will still ponder. Yeah right: I also got an account book, nothing in it yet, though. Besides our fitness assessment, we have to pass the aptitude (psychology) test. So, I am barely spared the trip to Munich. I delay sending away my boots, belts, socks etc. from one day to next. I just don't find the time to do it. Dad's last letter with the pictures made me very happy. We must resemble that, when we wear all of our cotton-twill overalls. I gave Gilbert one picture. To answer Mom's question, how many are we in one barrack: six young men, three of them Ostmärker, but only in the morning getting dressed, in the afternoon for work, and in the evening to undress. (Shoes, belt stuff, cleaning clothes and sewing). I sleep with three other young men in a small bedroom. (There are no beds in the barracks.) Now they also told us why so many were rejected. Most of them because they asked questions in their petitions or demanded conditions. From Styria, only we two [he and Gilbert] were admitted to the examinations. I already reported on the diverse composition. An old physics booklet offers invaluable service to me. I am glad that you sent me those booklets. About the grub, I'd like to add: we get so much in the morning—coffee, honey, butter, marmalade, bread, so that we are not able to finish. For brunch we get a snack. Lunch is diverse, mostly potatoes, meat, stewed fruit, seldom soup. Most of the time, I can't eat the stewed fruit, way too spicy. Salad is warm and sugar-sweetened (inedible). So I don't eat that and double on the other dishes. If you're full, you loosen your belt and continue until the command rings out: 3rd group of Hundred, stand up! If you are still able to get up, you're lucky. In short, all that we guzzle is amazing. Our afternoon snack has been doubled and I think, if we did not exercise so much, we would have gained several kilograms already. On Sundays and two times a week, we have snails. That is difficult to describe, a kind of cake, flat, looks like a curled up snake and is heavily sugar-coated. Tastes fabulous, and if you eat two pieces you are saturated, and with a couple of cups hot coffee, one can say one is pigged out. We once had salted herring. I ate three. First, I tried to remove the fish bones, with a knife and fork of course, for the educators pay attention that everyone eats in a proper way. I became hungry doing this so I ate them including the fish bones. That tickles in the throat like grandmother's rice. We get bread and butter with almost every meal. So, with every sandwich I am having a whopper of butter. We don't economize at all when it comes to food. Furthermore, the little cubs cannot eat as much as they get, and so they bring us, the gluttons, half of their portions. We get along very well with those small guys. They come over to us often and we play soccer or they show us their acrobatic feats. They are little dare-devils. They do headstands or handstands easily. They will become great guys one day. The news was broken gently: the 3rd group of Hundred's maneuvers would be cancelled. During this time, we should make up for the lack of ability to glide. Many young men already passed the A, B or C-examination for gliding. I have a lot to catch up with here. I believe the planned great-crossings will be similar. There are big negotiation talks about us in the Ministry of Education between the 21st and 24th and the curriculum will finally be set. The afternoon sessions are to be reformed as well. That's amazing! They always tell us, we do not do emergency-Abitur (final exams), but we need to know as much as an educated person in the fields of science. German language classes, therefore, are added, too. Latin lessons constrain us to read only those writers that report on the (ancient) Germans (all Germanic tribes). It is way more interesting than Flocki [Leopold's Latin teacher in Leoben]. In mathematics, I am really missing Demel [his professor in Leoben]. In English class we speak more German than English but we read a lot of English literature. Half of the newspapers in the reading room are in English. Gilbert was just here. He shook his head as he realized how long this letter was. He is doing homework, which I have to do myself, as well. You know our scenery already. There are many windmills here. There are storks nesting on some houses. A very unusual spectacle. Sometimes, a few seagulls come to us. I often had the opportunity to observe sunset, that is in the evening between 8:30 and 8:45. Wunderbar! It is said that it is even nicer directly on the beach. I want to say something else about the weather here: Sometimes it is very hot. Like today. When the onshore wind blows, it is ice-cold. And if only a land breeze, it is warm. On the 15th, it rained like crazy, afterwards it was very foggy. On the 16th, we went to the East Land Hall again for a great concert of Wagner and Beethoven. Pretty steep! Especially the conductor. I am writing in a confused way, just what comes to mind. Whenever the mail is handed out to us, it is the most gratifying moment for us and the mailman the most liked man that we see. So, like last week, it was nice when mail came from home almost every day. But I know that you haven't time to write, neither do I. We don't have Whitsun break and holidays because we are off duty now for four days. Any news in Leoben? Is Dad wearing his dress uniform? Did Willy come to an agreement with Prommer? Did Willy bring the shoulder boards of his coat to the Koiner? Has my coat been sold yet? Is Mom a member of the party already? Here, we all filled out applications for party membership, but for me it is rather unlikely to be permitted at my young age. From Rügen to Köslin is not far anymore; to Kolberg by steamship, then to Köslin by train. So now I have written enough. If you find Austrian stamps, please send them. An educator asked us for them. PS. You see the four platoons of the third group of Hundred in the picture. In front is Wolf, the leader of the group of a Hundred. In the right wing, our educators (platoon leaders). The second or third from the back on the right wing of the forwardmost platoon, that is me. The right bannerman (left in the picture) carries the old standard of the NPEA. All the way in the back, you see the market square, where the military rally took place. This picture looks like it was taken in Leoben in the Sauraugasse. Letter of 27 May 1939:(Sent then, begun earlier) Tomorrow and the day after tomorrow, our entire group of a hundred, except the people who went on vacation, is involved in roadworking - Köslin to Gross-Möllen (the beach). 19 May - Up at 3:45, leave by motor coach to the road construction post, then head out to the road site armed with shovels and spades. We were 30 youngmen with the academy leader who shoveled with us, with his shirt off and mud up to his ankles. On this day we moved 150 lorries (dumpcarts) of soil. We were done at 4 p.m. and went home as dirty as pigs. We cleaned our clothes and shoes, bathed and were treated for blisters on our hands. 20 May - Wake at 4 o'clock, to the workplace 10 kilometers away in pouring rain and this time we finished almost 180 lorries. That was naturally an enormous pleasure for us, because whenever such a caravan of 10 lorries was full, we all sat on top and rode along; in any case we made it completely comfortable for ourselves, although it was a dirty job and once again we sat dog-tired in the bus on the way home. Young men doing roadbuilding at a coastal village Gross Möllen, near Köslin. We were not the first to build streets here. (We laid more than 50 meters of street about 150cm deep.) The county party-director (Kreisleiter), the SA, SS, political administrators, and local party-directors (Ortsgruppenleiter) already worked before us. In our case, the educators and also the mayor and so forth, all had to help us to create the shortest connection from Köslin to the coast, since of course all available laborers in the west or the east are occupied. The money that we earned there went to a family with many children. On the way to their recreation home "Vineta"
21 May. Wake at half past 7, load onto a diesel, and the 12th platoon is on its way to Vineta. I want to explain to you briefly what this Vineta is. A resort of the NPEA located immediately on the coast, right on the beach on a small hill. So, that was really something! The last time I saw the sea it was not storming so badly. And here it was completely windless, such an amazing blue that it was almost impossible to make out the horizon. After a short stay we drove on to Kolberg, into the harbor-area, of course. Unfortunately no warships were there, but instead big steamers. As we thus go through the harbor-area a fisherman asks us whether we want to go out to sea with him; of course we immediately assented, and we went on a diesel-powered fishing boat through the harbor, past the jetty and lighthouse onto the open sea. What that meant to us you can certainly imagine. 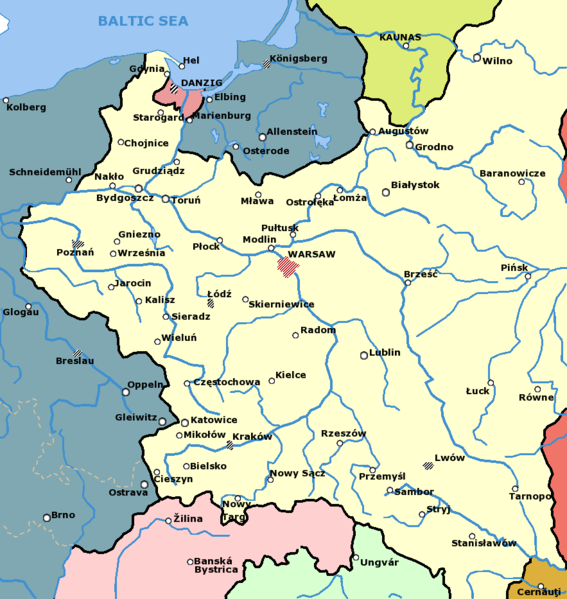 Map at right shows where Kolberg is situated relative to the German-Polish border in summer 1939. It's easy to see why the Germans had a righteous cause in demanding a corridor (protected highway). Click for larger map. The cadets enjoy a chance outing in a fishing boat from Kolberg Harbor; Bibi seated at far right, rear, with Gilbert directly in front of him. We were without educators and only our chauffeur was there, but he did not want to go along. ( The educators told us that they had to trust us to the extent that we would behave properly and not do anything stupid.) So we went out one hour, on out until the coast became quite small. We were only 18 young men, since most of us were at home on vacation. We were then allowed to sit at the wheel and steer, and into the machine-room, and we eagerly had everything explained to us. When we got back into the harbor again the fisherman told us he would gladly take us along on a 24-hour trip sometime when we wanted. Naturally, we wanted to do it but precious time did not agree. Then we see the city of Kolberg some more and after that we drive back to Vineta. Some very daring ones bathed, but the wind was blowing harder and harder, and the terrible thing about it is that even with the slightest wind my hands turn blue and I have to put on gloves. So the day compensated me and really all of us for many things. 24 May. Afternoon swimming and diving in the hall, always a riot! In the afternoon a lecture about the old cadets by the leader of the standby-troops. 25 May. Fencing; afterwards a film-presentation about the German navy by a captain of a frigate. At the same time he was also trying to promote the navy. 26 May. Your letter came of course. Before that we had roll-call by the lockers. Here the graduation test is just as back home, only in April or March. Immediately afterwards, Labor Service (RAD) in Pomerania, which is also called West Siberia. And then it goes to the soldiers. The main assessment was on Sports, but also on a cozy conference in a small circle with the institution leader and the educators. There I was asked, besides other things, if I would be captured, would I give my word of honor to the enemy not to flee, and if I may break it or not. I told the examinations commission on my word of honor that I would never give that up and would dare any possibility for flight. Then I was done. On the spinning chair I was given thick-lensed eye-glasses, through which I saw nothing, but through which the physician could always observe my eyes. After spinning, a stopwatch was used to measure how long it took until someone was no longer dizzy, because it was possible to see in each one that his eyes continued twitching for some time in the direction of rotation. Dad seems to be especially interested in how our outings are regulated. We are allowed in the city Saturday afternoons, and evenings into the moviehouse. Sunday the whole day, except in the evening. Some coffeehouses were recommended to us, but where soldiers are not allowed to go, we too are not allowed (dance halls etc). Whenever we go into the city or, off-duty, outside the campus of the institute, we have to put on our aviator uniforms (with Hitler Youth armbands); on Sunday in dress uniform (long pants and tunic) but they are not all available. No educators go along then. Previously we had to learn to do the greeting exactly right, but that has now, of course, already passed into the flesh and blood of each of us. I believe, in general, that the workshop is similar to what Dad enjoyed in machine-school. There are no newspapers from Ostmark here, unfortunately, so that I am very thankful to you for the newspaper clippings that you sent me. I am not the farthest away from home, since there is one in our office who comes from Villach, and in the 11th platoon a young man from Sofia. Also, one has come for testing, a young man, who is a German refugee from Madrid. Of course, only relatives of educators and relatives of young men from Köslin [Koszalin] were able to participate in the company picnic on Mount Gollen [Góra Chełmska]. That the houses were inadequately decorated is to be ascribed to the dourness of the Pomeranians, who are moved to enthusiasm only with great difficulty and have experienced no period of struggle. The picture that I sent you was made by the young man from Villach from my dormitory. I have only very few photos of the young men. Our educators have the same qualifications as other high-school teachers; in addition they must be good youth-leaders, and those that lead flying platoons are mostly reserve-officers of the Luftwaffe. The educators have to be with their youths throughout the entire day in the institute, and sleep here too, but their families live in the city. When it rains here duty usually continues; as soon as there is free time it’s quickly into the library or into the reading room. I am already very happy about working in the shop, but it is only once a week. We are apparently supposed to have one of the best and most experienced workshops in the Reich. We also have a radio, but we listen very rarely, mostly Sunday. We see no excursionists other than Hitler Youth groups. Mom asks why we had confinement to quarters. This is quite simple, since all it takes is for someone to go on the street without a cap or to be seen shopping in the city just once, and then it happens: confinement to quarters for all. Apart from our parades I was in the city only four times: (1- to get books, 2- at the barbershop, 3- May Day, 4- to send a package). Please, no unnecessary worries if I cannot write for a longer time now, but sometimes there really is not enough time. Aunt Greta wrote from Bruck, from Prommer, but I could not answer. Today at noon we also received our bottle of milk, and two jam-rolls; then I arrange two more for myself, and then I have something to do the whole afternoon while writing. But you need not worry that I will end up fat; our education in sports and field-training already takes care of that. I can vividly imagine that so many girls ask about me, although only Dad and Willy can write it. Willy asks whether we have vacation in the summer. Of course we have summer vacation exactly as back home. So, hopefully all questions are now answered. [1. & 2.] These two uniforms may be worn only while on duty in the institute. 3. Hitler Youth summer duty uniform; short pants. 4. Hitler Youth aviator uniform, long pants, shirt, cap (like Willy) but all light blue-gray. 5. Aviator’s dress uniform – still not ready, 3 pairs of shoes, track-suit, etc. The cadets delivering supplies in their short pants uniforms; Bibi in front on left. Gilbert let me know that his parents were informed that he received a free spot and so had to pay no tuition. How about us? Isn’t it possible that you can come here sometime with KDF? I have apparently forgotten my application number at WL; please send it to me; it has to be on all the papers from Munich. My number is, I believe, M/307/40. Neumühlenkamp: the glider field used by the Napola students for flight training. 10 June 1939: Because I brought home three ticks on 5 June, we went by bus to our glider field, which is 32km away from the institute. It’s called Neumühlenkamp. Now I can also tell Dad how it went for me during my first flight. On the first day as a beginner I got two takeoffs, in other words two quick hops during which I almost didn’t even leave the ground. It was only an unpleasant rumbling and yet I had almost flipped over during that. I careened immediately with the point into the ground, as if I wanted to drill for oil. On 6 June right away I got 6 takeoffs; that is an enormously high number for a flight-student. During that I got 10 meters high off the ground. I can’t even describle the feeling that I had the first time I heard the rumble in the machine stop and I floated above the team standing below. It was simply amazing. Also Gilbert got 7 takeoffs, but he overturned the machine once; he slid off to the right and crashed from about 12 meters. Of course nothing happened to him; the machine seemed to be okay too. Then I came for takeoff immediately after him, and as I got underway I noticed that the whole seat-back was missing. And yet this was my first faultless flight. Then I was no longer strapped to the back wall but the back wall to me. The flight-instructor told me that the flight was very nice. But then I was overconfident and landed in a creek twice. The first time I lucked out and I remained dry. But during the second landing the yaw-rudders were stuck in the water and it splashed up under the pilot’s seat. Then on 7 June, no longer were we all allowed to take-off; instead the flight instructor chose the six best from the previous day and I was among them. Now we had to go down from a higher hill in a fairly strong wind. And now I made 6 smooth landings one after another. The flight-instructor wanted to train us as much as possible and had the other two excluded. On this day, Gilbert got only one easy take-off. Thus, in the end, only four young men were still flying. Gliding down from a higher hill for a smooth landing. In the evening we were notified that out of the 650 beginning students, one young man had made 4 qualification-flights; two young men had made 3 qualification-flights; and then a couple with 2 and 1 qualification-flights. I am one with the 3 qualification-flights. In other words, I must make 2 qualification-flights then I am allowed to make my AS-flight and with that the A-test. Of course, I was very pleased. In these short flights I was never able to observe the surroundings. Only once have I seen the team from the plane. I can’t even remember ever seeing anything. Afterwards I only know every movement of the joystick and the yaw-rudder. I certainly know to the smallest detail which hand-movements I had made. That certainly has to be the case only in the most serious flights where one concentrates so much that one has no eyes for the surroundings. The sailplane "Grunau Baby" is hauled using muscle-power to the launch site on the crest of the hill. But the labor that gliding requires, one imagines it to be too easy. Twenty men must labor without limit most of the time so that one man can fly (take-off team with rubber strap, stop team to bring the plane up, to haul the rubber strap back to the mountain); it’s not at all easy. And we were all dead tired when we crawled into bed around 8 o’clock in the evening. Six o’clock in the morning was reveille; then we bathed in a nearby lake, and then flew until the evening. Meanwhile it was very hot and we have become brown like American Indians. On the 7th in the evening we went home again. So now we are going every two weeks for a couple of days to the airfield, then one and a half weeks of instruction again, and so on. Thus 19-21st June we have flight-duty. 15th to 31st July motor-sport school at Tramburg. Then vacation until 1st September. Now I don’t know what I am supposed to be doing. 1. The army would pay for the trip home from Tramburg to Leoben. Consequently the trip home would cost me nothing. 2. During vacation I am going to the Agricultural Service (Landdienst), because people are sent there. I am asking you to write to me what I should do, since our platoon-leader already informed us that the trip home from Tramburg was requested. Meanwhile I was handed over from Munich to Berlin and received the processing number 1373. I am not pleased about that. Recently, we again received a whole package of name-tags and laundry-labels, which now have to be stitched to all pieces of clothing. I have been working on it two days already and always when I believe that I have finished there is yet another piece. Enclosed I am sending along a couple of pictures. One from the road-construction (the man in the bootcut trousers is the director of our institute); the other is our trip to Kolberg. 11 June 1939: I just read in the Völkischer Beobachter that the civil defense organization (Technische Nothilfe) by a law of the Reich became state auxiliary police. Then I will probably have to write to Herr Hipo Wenger. [Leopold Wenger Sr. is a member of that organization in Leoben -cy] Today most went to the sea, but I have to learn the traffic-signs for the driving test because I have no experience there. Please send me right away a (certified) copy of my baptismal certificate, which I have to send to Berlin. Also ask about the blue waiver; I need it for my flight-book. 18 June 1939: Is Mom driving to Gleichenberg during the vacation? And is Willy coming to Salvore? When does vacation actually begin for Willy? Tomorrow we have the end of school, then there’s flying. This week the 1st and 2nd Hundreds are going to Carinthia for maneuvers. Some platoons will travel over Leoben; perhaps you will see something of that. The big maneuvers take place at Villach. Rositten 29 June 1939: I was able for the first time while dragging the glider up the hill to observe the surroundings, and then I also saw for the first time the giant elk as they strolled out from a small patch of woods. It was great! Whether I will be able to come home is doubtful, because it is uncertain whether the cost of the trip will be covered for us. There is flying tomorrow at 7am; consequently we have to be asleep already around 9 o’clock. Most of the young men already go to sleep around 8 o’clock. So regards now and kisses as well to Gretel, Gerhard Adolf, and Willy.